Have you ever tried tempering chocolate with a Sous Vide? Yes, I have. In theory it seems like it should work perfect. Super stable temperature settings. A warm insulating water bath. Hands off controls. For those not familiar, this is an example of one. It is basically a circulating water heater with both accurate and precise temperature control. And can help you make utterly killer rare steak! Unfortunately, in practice, it is rather inconvenient and downright causes problems in other ways with chocolate tempering. But there are other uses for it chocolate making and I’ll explain those later one. Well, first off it is a water bath and working with it and chocolate together rather feels like working with a live electrical line. If you are good and know what you are doing, you are mostly safe, but…..chocolate – water. Rarely a good mix. After getting over the fact that I could not seize my chocolate with the water present, the main thing was that it took way too long to melt the chocolate. It took 2 hours for me to melt 2 lbs of chocolate to 95 F. The main issue was the water was 95 F. And with the chocolate beingjust a bit cooler at 75 F, the flow of heat is very slow. Sure, I both could have mixed it by hand and turned up the heat, but in that case, there was no reason not to just get a bowl from the cupboard and melt the chocolate over a pot of hot water. Either way I was controlling the heat myself and stirring manually. After a couple hours, and some hand kneading (pst, don’t tell, but I turned it up to 98 F too) the chocolate was finally melted and flowing. I considered tossing in a bit of seed but realized I had no good way to get it mixed 100% well and also had not good way to get it out of the bag it was in without both making a mess and causing so much edge sheer that I had a lot of bloom. I settled on cutting the bottom edge off the bag and squeezing it out like frosting from a piping bag. That worked well enough except for the loss of a perfectly good bag. I then mixed in my seed and proceeded as normal. I shudder to imaging if I had to temper 5-6 lbs of chocolate this way. A sous vide may have great temperature control but the drawbacks are too severe for routine use of tempering your bulk chocolate. Recall though I said there was another great use for a sous vide? That use is making cocoa butter Silk. What is Silk you ask? I tossed out a Twitter poll the other day (go vote, a couple hours left), and granted the response rate was low, over half the responders didn’t know what Silk was. Silk is great and amazing and what you should be tempering your chocolate with. I’ll tell you how to use it in a moment. In short, it is really nothing more than tempered cocoa butter. Some time ago I reviewed the EZTemper. Its sole purpose is to create cocoa butter Silk. It is basically an air incubator. It holds your cocoa butter at 92.5 F where over the span of 24 hours crystallizes into extra hardy, super aggressive Type V seeding crystals. Oh, and is like silky thick buttercream when you pull it out, hence the name. Note how it is opaque and thick. Melted cocoa butter is clear. That opaqueness at the right temperature (92.5 F) is the sign of successful Silk. And a sous vide is nothing more than a water incubator. You can set it for 92.5 F (or 122 F and make great steaks!! ), put in a sealed jar (get rid of that plastic bag) of chopped up cocoa butter and come back 24 hours later to Silk. What do you do with it? You temper with it. And it goes like this. 3) Pour your Silk seeded chocolate into your molds. You will probably notice that you are tempering at a much higher than normal temperature. This is because the Silk is pure seed crystal. It gives a great scaffolding upon which the chocolate’s cocoa butter can and will crystalize around so the temperature can be hotter. Being warmer also means the chocolate will be less viscous and so has less edge sheer, so inadvertent edge bloom is reduced. *Oh, that range of temperature. You can allow your Silk to set up. If you do that, then you want your chocolate at 94 F so that it can melt the Silk and end up at about 92.5 F. If you are using it fresh from the water bath and it is still creamy, then it’s at 92.5 and so you add it to chocolate at 92.5. And a couple other things I discovered. You can seed other cocoa butter and shorten your 24 hour incubation time. I had one batch of cocoa butter that fully melted (I’ll be writing a full how-to of Silk making and will address this) so I added about 10% Silk to it and left it to incubate at 92.5 F for about 1 hour. The seed propagated and made more Silk quickly and I’ve successfully tempered a couple batches of chocolate with it. It may turn out that theory and practice will part company at some point, but in theory I cannot come up with any reason you could not continuous re-seed cocoa butter to make new Silk over and over in less than 24 hours. 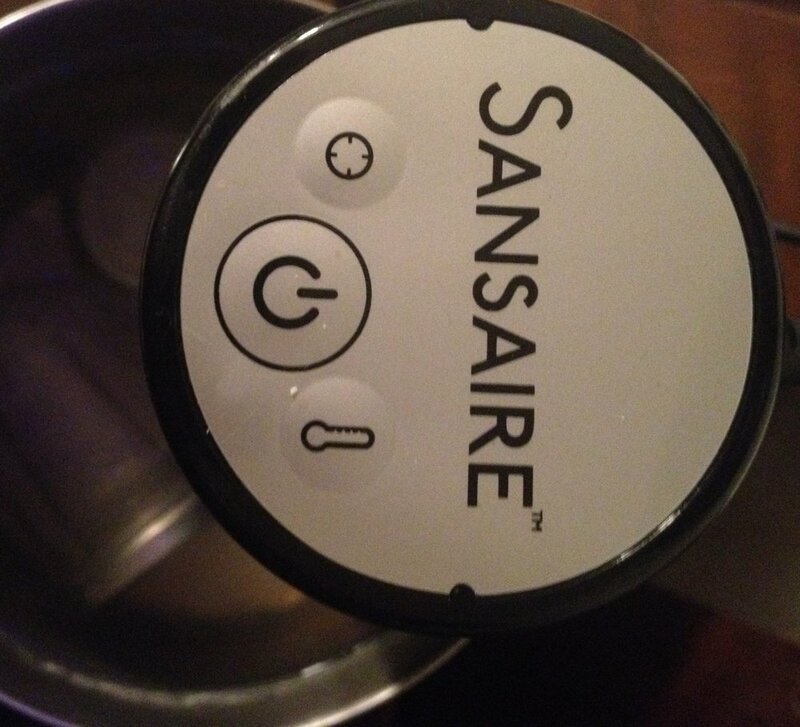 So, with all that in mind, go get yourself a Sansaire Sous Vide. I can’t recommend it enough. And if you don’t want to do that, let me know either by email or comments below if you would be interested in purchasing a little Silk. I’m thinking of offering it over the winter months.